Ilmeni Dren, a Dunmer noble, is a House Cousin for House Hlaalu. Ilmeni Dren can be found at St. Delyn Canal South-One in Vivec. Ilmeni is Duke Vedam Dren's daughter. 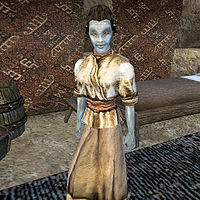 She is also one of Morrowind's most prominent anti-slavery campaigners, and leader of the Twin Lamps organization of abolitionists — which brings her into opposition to her uncle Orvas, owner of one of the biggest slave-run plantations in Vvardenfell. At some point in the past, she had an affair with a Buoyant Armiger, who has had a glove of hers (given as a token of her affections) stolen from him. She has hired the Imperial Legion to find someone to recover it. This page was last modified on 5 July 2013, at 13:46.